When I was a tutor in college, my biggest challenge was dealing with students who thought my job was to make learning effortless and fun. They were often incensed that I could only help them if they were already willing to work hard. Over and over they'd ask in a tone reserved for bad wait-staff at a restaurant, "Hey, isn't it your job to make sure I learn this?" Fortunately, a poor grade on a quiz or assignment was usually enough to remind them that learning was ultimately their responsibility, not mine. Game designers, on the other hand, have no such luxury: They must constantly strive to make the learning process in games as fun and painless to players as possible. And paradoxically, the better they have gotten at teaching gamers the mechanics of their games, the less patience gamers have for instruction. This race between diminishing attention spans and less intrusive training has been a major force in gaming's ongoing evolution, influencing which genres have flourished and which have foundered. In gaming's infancy, every game came with a printed manual regardless of whether or not it helped players learn to play. The Super Mario Bros. manual contained a comprehensive section about enemies, explaining in detail the role of the Goomba in Bowser's army, as opposed to that of the Koopa Troopa or Paratroopa. It was less a manual than a field guide to the Mushroom Kingdom - after all, it doesn't take an exhaustive knowledge of Koopa taxonomy to know to jump on their shells. At the other end of the spectrum were games like Falcon 3.0, which came with a gruesome flight manual that dwarfed the average college textbook. Learning to play a sim of that caliber involved serious study, and the manual was designed for someone willing to pour hundreds of hours into the hobby. Although they are polar opposites in terms of complexity, Mario Bros. and Falcon 3.0 reveal similar assumptions about gamers in the late 1980s and early 1990s. Their manuals were meant for an audience who demanded thorough documentation, whether the game was a 2-D platformer or a model of one the most advanced aircraft in the world. As time went on, it became clear most gamers neither needed nor wanted that level of detail. Publishers learned they could easily cut costs by reducing or eliminating documentation; in fact, by confining detailed gameplay information to official strategy guides, they could increase revenue. More significantly, however, developers began to understand that manuals were rarely the best teachers. 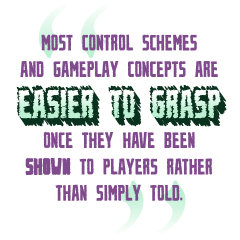 Most control schemes and gameplay concepts are easier to grasp once they have been shown to players rather than simply told. In-game tutorials provided players exactly this kind of hands-on instruction. They allowed players to learn new game mechanics in a failure-free environment that prepared them for the tasks ahead. And while they weren't always the most memorable part of their respective games, they were perhaps the most enduring. Most long-time PC gamers remember the tram ride into Black Mesa at the start of Half-Life, but my first experience with the game was playing through the training level where the game's relatively new mouse-and-keyboard controls finally clicked for me. Click here to download the special edition PDF for this issue!